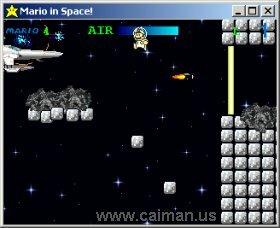 Caiman free games: Mario in Space by Thunder Dragon. Mario was awoke by someone breaking into his room. Just when he was getting up, he was knocked out by a hammer. Later, he was awoke again by a loud crash. He looked out his window and saw what looked like the moon. 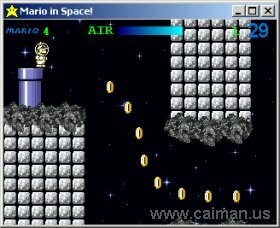 Mario had been stuffed into a rocket and sent to the moon! Luckily, he found a space suit and laser blaster on board. Verzamel de centjes om jouw lasergeweer met energie bij te vullen. 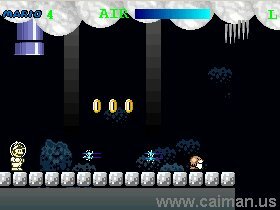 Super Mario 3: Bowser s.